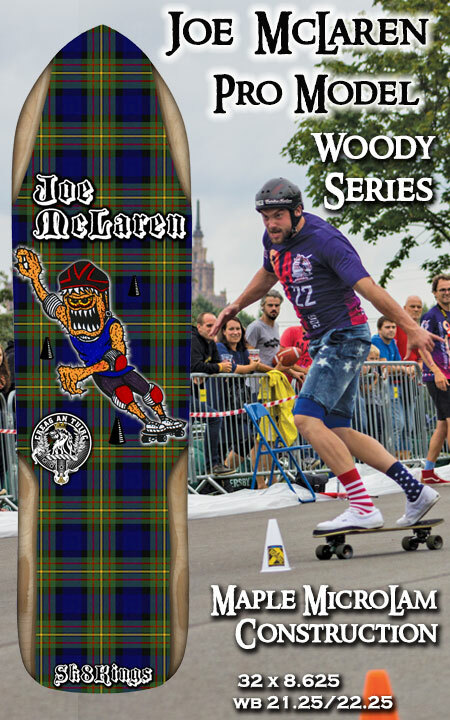 About the McLaren Beast graphic: Featuring the popular "beast" character which was inspired by Joe McLaren's likeness and designed by Tim Kienitz for the Sk8Kings US Nationals race graphic - this new graphic includes the McLaren Family Crest and a backdrop of the McLaren tartan in honor of Joe's Scottish heritage. Creag an Tuirc translates to "Boar's Rock" in Scottish Gaelic and was the traditional rallying point of Clan McLaren - one of the most ancient clans of Scotland. For International Shipping Ratesinquire by e-mail: info@sk8kings.com Rates vary by country so please include your shipping address in e-mail.